"Living animals" are treated as restricted goods; therefore, an import permit from the Department of Livestock Development is required when passengers bring their pets with themselves into Thailand. Besides, they are not exempted from duty. The passengers take their pets and the documents required in item 1 above to the Suvarnabhumi Airport Animal Quarantine Station (AQS). Veterinary officials at the AQS will issue an import permit for the passengers if the pets meet the import permit requirements. The passengers present the import permit and their pets to Customs officers at the “Goods to Declare” channel, and make payment of duty and taxes. The passengers present the documents in item 1 above and their pets at the AQS. 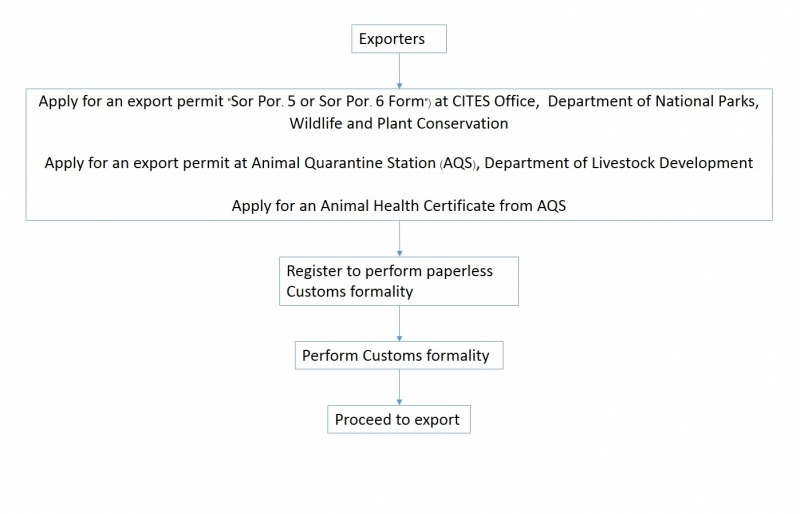 Once the veterinary officials at the AQS have completed document inspection and animal health check, they will issue for the passengers an export permit as well as a Health Certificate, which will be required to be presented at related units in the destination country. Note: The Suvarnabhumi AQS is located on 1st Floor of the CE-1 Building, Free Zone, Suvarnabhumi Airport Cargo Clearance Customs Office. Remark : For more information on application for the above permits, please visit the Department of Livestock Development’s website at http://www.dld.go.th. The assigned Customs officer will examine the shipment, its HS Classification, Customs valuation and import permit. If it is found that the declaration is accurate when compared with the shipment, the Customs officer will record the inspection result in the computer system. The warehouse will be informed of the release of the shipment from Customs custody, and the importer is liable for retrieving the shipment from the warehouse. Remarks: the Letter of Approval of Importation/Transit/Transshipment of Animals or Carcass (Letter Ror. 6) has to be issued prior to the date of import. Failing to do so is considered violating Section 244 of the Customs Act B.E. 2560 (2017). Ensure that the shipment is bonded or guaranteed that it will be exported in six months from the date of import. In this regard, the name of the Customs House for the export of such shipment must be specified. Register at any Customs offices throughout the country to use the e-Customs system. At the Free Zone, Suvarnabhumi International Airport, the registration can be done at General Administrative Sub-division, 2nd Floor, BC-1 Building on 0-2134-1232. Use the service of submitting export declaration data provided by Customs officials at Customs Service Sub-Division 1, Customs Service Division 2, 1st Floor of Building “CE.” In this case, the exporters must provide data to be completed on the declaration form and National Identification Card or Passport, and make payment of Customs fee. The Customs officer will then return the Cargo Permit to the exporters/agents so that they could take their pets to weigh at the warehouse and pick them up.